“You must care about this general election in a way that none of us have ever done before,” said Stickland, who faces a challenge this fall from Democrat Steve Riddell. Texas hasn’t voted for a Democrat for president since Jimmy Carter in 1976 or elected a Democrat statewide since 1994. Yet in the first midterm election of Donald Trump’s presidency, Democratic candidates are waging aggressive campaigns in places that haven’t seen a serious race in recent memory. Democrats are now targeting eight congressional races in Texas is districts currently held by Republicans. Senate candidate Beto O’Rourke, who is running against Sen. Ted Cruz, R-Texas, has raised more money than any U.S. Senate candidate in history, funds that Republicans worry could trickle down to help other Democrats. For the latest updates on the 2018 Texas midterms, follow along here and sign up for news alerts here. To support more elections coverage like this, click here for a digital-only subscription. Tea Party leaders insist their base is big enough to stave off a Democratic uprising without compromising their conservative values, as long as their party sticks together this fall. But at this week’s tea party’s event in Grapevine, they were still hammering messages aimed squarely at conservative loyalists. “People ask me, ‘what are you going to do when you get to Washington?” said Republican congressional hopeful Ron Wright, who previously served as Tarrant County Tax Assessor-Collector and on Arlington’s city council and as mayor pro tempore, a nonpartisan role. “I say, ‘Well I’m going to join the [conservative House] Freedom Caucus and bask in the glow of [Rep.] Louie Gohmert, (R-Texas),’” said Wright, citing a controversial conservative firebrand who also addressed the group that evening. Speaking to the NE Tarrant Tea Party Oct. 17, 2018, Republican Ron Wright, who is running to replace Rep. Joe Barton, vows to join a conservative club on Capitol Hill. This week national Democrats included Wright’s race on their list of Texas congressional targets. Wright’s campaign, which took on a big debt fighting a tough primary runoff against fellow Republican Jake Ellzey, is a seat Republicans have won easily in recent years, but is now being targeted by Democrats. Among others: In San Antonio, Republican Chip Roy benefited from millions of dollars from conservative outside groups in a heated GOP primary to succeed retiring Rep. Lamar Smith, R-Texas. Roy, who was slow to fire up his general election campaign, now faces a tougher-than-expected race against Democrat Joseph Kopser, in a district that Smith held easily. In Houston, Republican Dan Crenshaw donated $100,000 to a GOP leadership PAC after securing the GOP nomination in a tough primary race to replace retiring conservative Rep. Ted Poe, R-Texas. Crenshaw’s race is also now on Democrats’ target list for November, as he faces a general election contest with Todd Litton. Lt. Gov. Dan Patrick, who personally invited President Donald Trump to campaign in Texas, urged conservatives at the tea party gathering to vote “straight ticket” for Republicans on the ballot this fall — including those he’s long sparred with. Patrick this fall faces a challenge from Democrat Mike Collier, who was endorsed by Patrick’s failed GOP primary challenger, Scott Milder. 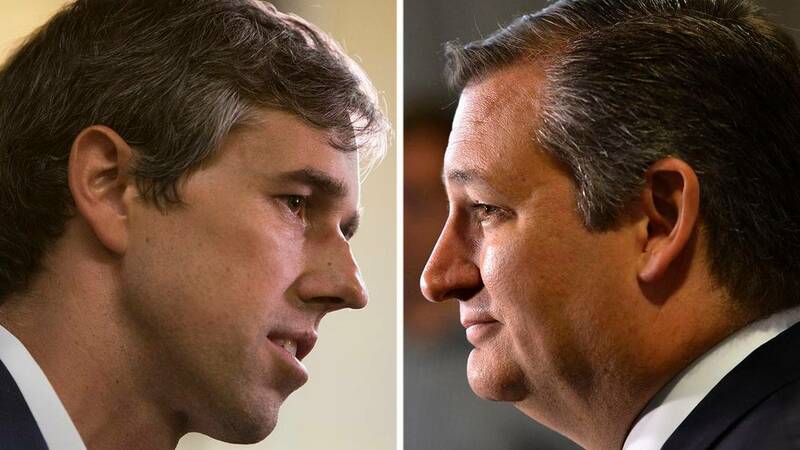 Go behind the scenes of the race between Republican Ted Cruz and Democrat Beto O’Rourke.